Britannica online is managed by Encyclopedia Britannica, with more than 230 years experience gathering and organizing information on thousands of subjects. The website provides limited services, like search results, for non-subscribers, while members have unlimited access to the full updated content of the 32-volume Encyclopaedia, to other publications and online services. By searching a word, users obtain also related websites, videos and media. Browsing possibilities are available for a world atlas, an A-Z index, selected topics through history. Also provided are the Merriam-Webster, a free online English dictionary with definitions, pronunciation, synonyms, etc., as well as a free e-mail newsletter containing links to Britannica articles and multimedia features. Beside its many international versions, Original Sources is available by site license to colleges, universities and libraries worldwide with fully searchable primary documents and is accessible through easy-to-navigate subject headings. The interaction with the website is facilitated by the Britannica Blog (with related forum), the RSS newsfeeds subscription and many dynamic images in the home page, somehow increasing the typical information overload. Among the recently introduced features, there are the new kids applications for iPhone, iPod and iPad. I am a writer and thought I would give Britannica Online a try as a research tool. Within weeks I found it did not turn up in a Google Search near the top as it promised, it was awkward to use, and seldom provided more than I could just as easily glean from the Internet, so I wrote it off a poor decision and determined not to resubscribe. Unfortunately I subscribed with a credit card. A little more than a year later I learned they had re-subscribed me without my permission. When I called and said I did not want or use the service, they told me too bad, they had the legal right to charge me for another year since I did not formally terminate. I never enter into auto-resubscribe services. I consider their “auto-renewal” fraudulent. Avoid this company at all costs! refers to online reference and information services providing proprietary content in the format of simple and concise information in the various fields of knowledge. 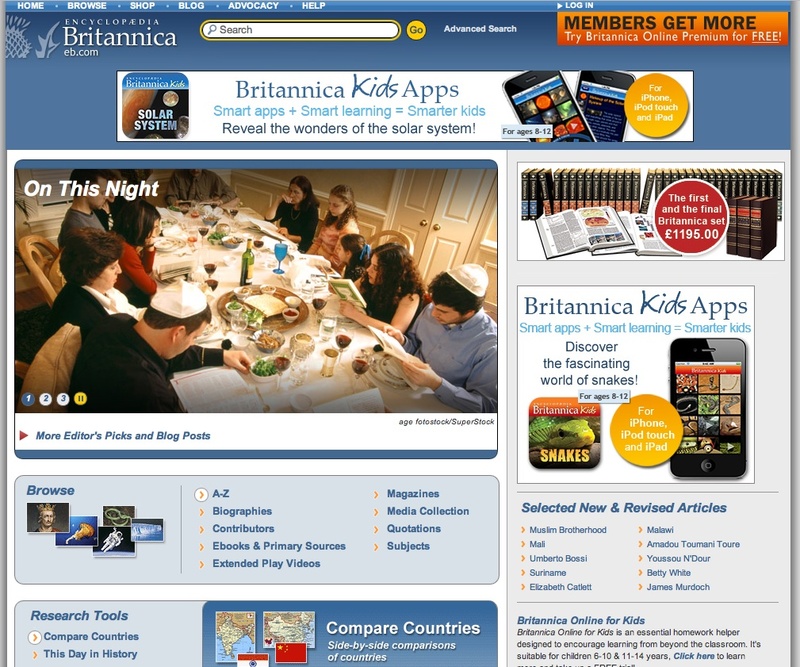 In many cases, online encyclopedias are the electronic development of pre-existing printed sources, as it is the case with Britannica on-line which is managed by Encyclopedia Britannica, a cultural institution with more than 230 years of experience in gathering and organizing information on thousands of subjects. This category of e-sources emphasizes at its best the hypertextual features of the electronic language by organizing a huge amount of information in a multiple in-depth path of navigation. For most records an abstract, a list of external/internal references and a specific collection of related info and metainfo are usually provided, often on a fee basis.